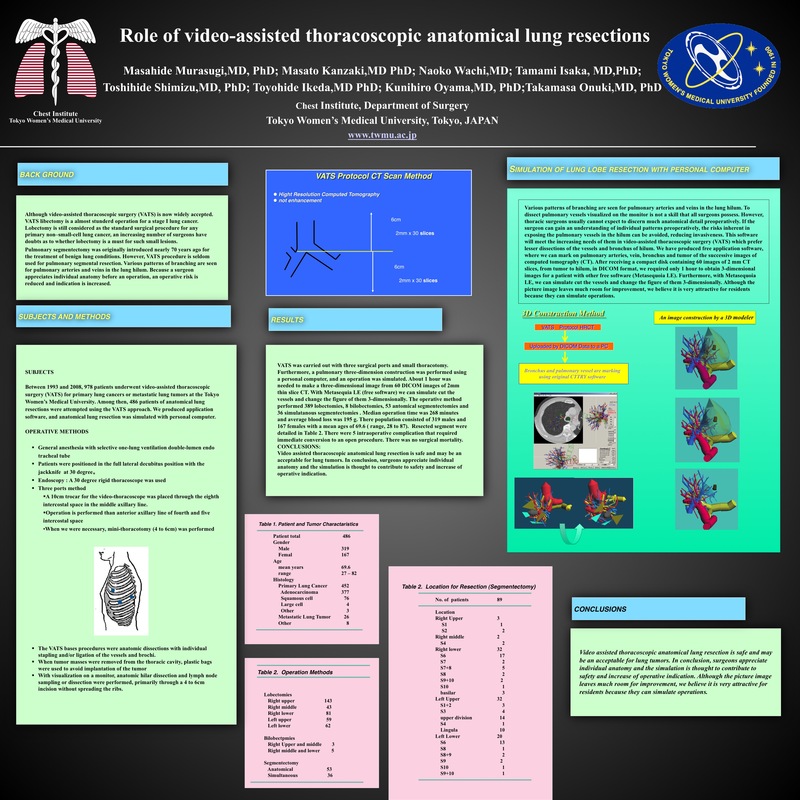 INTRODUCTION: Although video-assisted thoracoscopic surgery (VATS) is now widely accepted. However, VATS procedure is seldom used for pulmonary segmental resection. Various patterns of branching are seen for pulmonary arteries and veins in the lung hilum. Because a surgeon appreciates individual anatomy before an operation, an operative risk is reduced and indication is increased. SUBJECTS and METHODS: Between 1993 and 2007, 857 patients underwent video-assisted thoracoscopic surgery (VATS) for primary lung cancers or metastatic lung tumors at the Tokyo Women’s Medical University. Among then, 369 patients of anatomical lung resections were attempted using the VATS approach. We produced application software, and anatomical lung resection was simulated with personal computer. RESULTS: VATS was carried out with three surgical ports and small thoracotomy. Furthermore, a pulmonary three-dimension construction was performed using a personal computer, and an operation was simulated. About 1 hour was needed to make a three-dimensional image from 60 DICOM images of 2mm thin slice CT. With Metasequia LE (free software) we can simulate cut the vessels and change the figure of them 3-dimensionally. The operative method performed 321 lobectomies, 9 bilobectomies and 39 segmentectomies. Median operation time was 278 minutes and average blood loss was 198 g. There population consisted of 235 males and 144 females with a mean ages of 66.7 ( range, 28 to 87). Resected segment was S6 (n=13), left upper seg. (n=8), left4+5 (n=7), S7+8 (n=5), S1+2 (n=3), S3 (n=1), S7-10 (n=1), S10 (n=1). There was no surgical mortality. CONCLUSIONS: Video assisted thoracoscopic anatomical lung resection is safe and may be an acceptable for lung tumors. In conclusion, surgeons appreciate individual anatomy and the simulation is thought to contribute to safety and increase of operative indication.